For fine or flyaway hair Volume Boost Conditioner gently detangles and smoothes without the commonly-used silicones that can weigh down fine hair. The caring formula is enriched with comfrey and echinacea plant extracts, a combination recommended by botanists to enhance fine, flyaway hair. 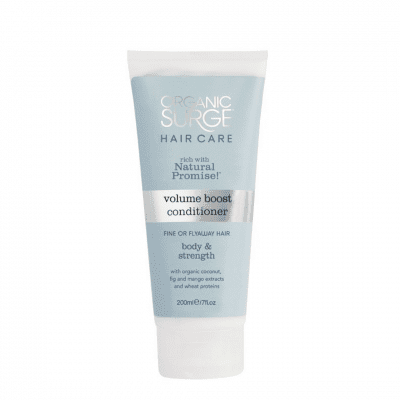 For fine or flyaway hair, Volume Boost Conditioner gently detangles and smoothes without the commonly-used silicones that can weigh down fine hair. The caring formula is enriched with comfrey and echinacea plant extracts, a combination recommended by botanists to enhance fine, flyaway hair. 100% silicone free detangling and conditioning. Enriched with body-boosting comfrey and echinacea plant extracts. How To Use: Use after Volume Boost Shampoo. Massage Volume Boost Conditioner through the lengths of your hair then rinse well. Organic Surge is a brand with a conscience, providing natural & organic skin, hair & body care products offering you an extensive range of natural products, all made with skin-loving, natural ingredients and deliciously fragranced with organic essential oils. Channelling the vibrancy and goodness of nature into our everyday lives.